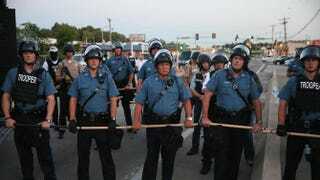 Police stand watch as demonstrators protest the shooting death of teenager Michael Brown Aug. 13, 2014, in Ferguson, Mo. Last week the Department of Justice released its report documenting the racial discrimination and bias that is endemic to policing in Ferguson, Mo. The deep problems unveiled by the DOJ’s investigation reflect a harsh reality that exists in many places across the country—not just Ferguson: At every level of our criminal-justice system, African Americans are discriminated against, and the report sheds light on the daily indignity, abuse and discrimination that black and brown people across the country face at the hands of police. The DOJ also announced that it won’t prosecute Darren Wilson, the Ferguson officer who shot and killed unarmed teenager Michael Brown—and the complete lack of accountability reflects a pattern that’s become all too familiar in America. According to the latest FBI statistics, black Americans are killed by police at nearly the same rate as Jim Crow-era lynchings. And that’s likely an understatement, since there remains no federal database on police use of force despite recent calls for such a database at the highest levels of government. Since Michael Brown was killed this summer, a new and growing racial-justice movement has emerged to demand an end to state violence targeting black and brown communities. This movement has succeeded in keeping the conversation around violent and discriminatory policing alive, and has already forced a number of important reforms onto the national agenda. Late last year, President Barack Obama issued an executive order reforming federal programs that provide local and state law enforcement with military weaponry and called for funding 50,000 police body cameras. The president is now considering a number of important reforms recommended this week by the newly established Task Force on 21st Century Policing, before which I recently testified, representing the voices of more than 1 million ColorOfChange members and our allies. The Justice Department is taking action against inhumane abuse and discrimination in Ferguson. But the reforms now being discussed, while important, will barely scratch the surface of a problem that demands deep, far-reaching transformation. Unless our national leaders take definitive action to implement deep, structural changes to end this human rights crisis, we will continue to have an unequal, deadly, broken system of justice and policing that can’t be trusted. The DOJ’s recommended reforms in Ferguson do not go far enough and place the onus on police to police themselves. We need more than just trainings and data collection, but rather the creation of entirely new systems of accountability, such as community-review boards with the power to hire and fire police, as well as a complete overhaul of current leadership. DOJ investigations are only as significant as the real-world, structural changes to policing that they produce. Time and time again, as we’ve seen in Cleveland, New York and other cities across the country, local officials fail to enact the sweeping changes needed to prevent police violence, discrimination and corruption, despite federal intervention. And the DOJ needs to ensure that Ferguson officials and law enforcement swiftly and effectively implement their recommendations and more. That leadership needs to come from the top, and it needs to be bold and uncompromising. We urge the president to issue an executive order enforcing and expanding federal bans on discriminatory policing, strengthening systems of police accountability, implementing the collection of nationwide data on police use of force, ending federal anti-drug grants and massively reinvesting in community-controlled policing. The DOJ also needs to start prosecuting more civil rights cases. In the space of a week, we have seen George Zimmerman and Darren Wilson avoid any accountability under our civil rights laws. Attorney General Eric Holder has called for changes that will make it easier for the DOJ to prosecute civil rights cases—a critical goal. As President Obama has said himself, now is the moment to transform policing. Ferguson is America. And the urgency of the problem calls for more than task forces, commissions, speeches and reiterations of a higher standard of policing. We need structural policy changes, new enforcement mechanisms and a transformation in how we think about and realize the relationship between police and the communities they are meant to protect and serve. A growing new civil rights movement is pointing the way. Now we need the president to listen, and to act.